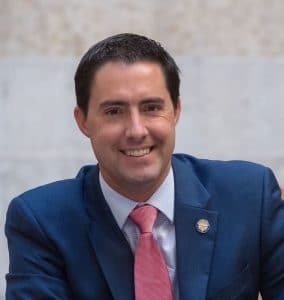 Impact Ohio is excited to announce that Ohio’s 51st Secretary of State, Frank LaRose, will participate at the 2019 Akron Regional Conference on Tuesday, April 23rd at Quaker Station at University of Akron. At 2:15 p.m., LaRose will be a panelist on the “Creating a Culture of Civility in a Divided Society” panel and at 3:15 p.m. he will discuss his plans for the office of the Secretary of State. As Ohio’s Secretary of State, LaRose is doing his part to deliver a thriving democracy and a prosperous economy. In his role as Ohio’s chief elections officer, he’s working to ensure Ohio’s elections are both secure and accessible. He is also supporting Ohio entrepreneurs as the sole authority to receive and approve articles of incorporation for Ohio businesses. In the legislature, LaRose spearheaded efforts to increase government transparency and efficiency, particularly in the areas of elections administration and regulatory reform. We look forward to having Secretary LaRose join our regional conference to discuss issues that are important to both him and Ohioans.